It's fascinating to get a glimpse into how Bible characters interpret Bible events. Here we see Stephen's version of the story of Moses. 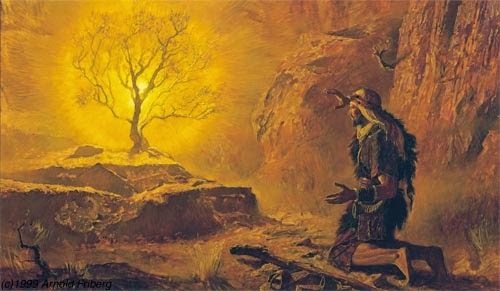 He delves into Moses' mind a bit, adding a layer to the Exodus account of the same events (Exodus 2:11-15): "For he supposed that his brethren would have understood that God would deliver them by his hand…"
We can imagine young Moses, a Hebrew, raised by Pharaoh's daughter, mulling over why his life took the direction it did. There must be a reason. It must be to save his people. And so he decided to act on that conviction and the result was a murder committed and a 40-year detour herding sheep in the land of Midian. But he was right in one thing. It was his destiny to free his countrymen. Only it would happen in God's time when, after forty years, God came to him with "'And now come, I will send you to Egypt.'" In the first instance he sent himself and it was a disaster. But when God sent him, it was a success. Do you you have a sense of mission or task that your life is to fulfill, but up till now nothing has fallen into place to bring it about? Let Moses' story be a caution sign to you and me not to force the issue by taking matters into our own hands. Rather, let's wait for God's "And now come, I will send you…"
PRAYER: Dear God I am often impatient wanting my life to fall into place in my own timing. Please help me to wait for Your initiative. Amen.